These days, many people feel that they simply don’t have the time or energy to cook. Feeling too busy or tired to make dinner after work each evening, we may instead turn to fast food, TV dinners or delivery. However, these options should be off the table during medical weight loss, and you don’t need them—with a few simple strategies, you can prepare your own healthy meals efficiently and easily. Tools. Keep similar items together close to where they’ll be used. Things you use infrequently can be moved to an out-of-the-way storage area to make it easier to find the items you need. Prevent the dishes from piling up by doing them while your meal cooks, or directly after you eat. Recipes. Instead of looking for a good recipe right before you cook it, try sitting down once a week to come up with a plan for the days ahead. Ingredients. Once you have your meals planned, head to the grocery store to get everything you need in one trip. You can use a whiteboard or chalkboard to keep a running list of the things you need to buy. If you find yourself running out of time to cook in the evenings, try doing some prep work in the morning instead. 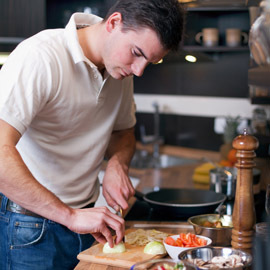 By chopping up your ingredients ahead of time, you’ll be able to simply drop everything in the pot and get cooking. You can also speed things up with prepared ingredients like canned and frozen vegetables—just be sure that they don’t have any added ingredients that make them less nutritious than their fresh counterparts. A slow cooker. This handy appliance will cook your meal for hours on its own. Just throw in the ingredients, flip the switch and come back later for a home-cooked meal. A rice cooker. This appliance can make perfect rice in a jiffy, but much like the slow cooker, it can also prepare a healthy meal on its own. A rice cooker can be make soups and stews, as well as boil, sauté or steam just about anything that will fit. A microwave. This kitchen essential can be used to defrost, boil and quickly cook ingredients. Many people think they don’t have time to cook, but making the cooking process quicker and easier will ensure that you always have the time to make a healthy meal as you lose weight.